1. Why did you choose to write ménage? What intrigues you about this particular genre? I love writing about the dynamics between two men learning to share a woman. Some stories jump right into a ménage but I think it’s more fascinating for the men to grow into the love and all the sidesteps they have to take to reach a HEA. 2. 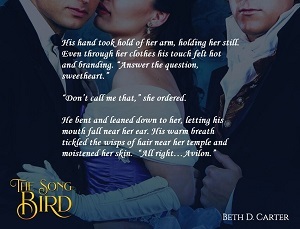 Tell us about your latest ménage, The Song Bird: what’s it all about? Where did you find the inspiration? I got the inspiration for this story after a vacation in San Francisco. Set a few years after the gold rush of 1849, in San Francisco when the city grew too fast for the local law enforcement to keep the peace, many citizens decided to take matters into their own hands. The largest vigilante group grew and the end result was the hanging of eight men. 3. In your opinion, what makes a good ménage novel? Believability. Living in a ménage relationship is hard work so there has to be a dance of some kind to figure out how it all works. Human flaws have to be worked in and resolved in an organic way. You can’t have insta-love and a HEA without breaking something along the way. Know what I mean? 14. Tell us about your future projects. I have two books in my publisher’s hands, waiting on a yea or nay verdict. One is a time travel where the hero travels back to 1927, told from his POV, and the other is a short story about a hired bodyguard. Fingers crossed! Thanks for dropping by, Beth! 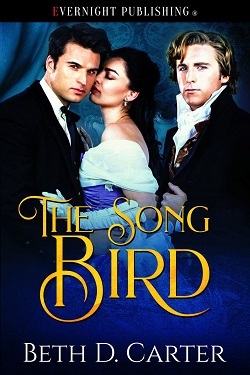 Can’t wait to read The Song Bird!